Prof. Dr. Golo Föllmer is media scientist and musicologist. 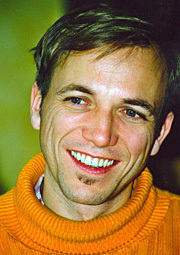 Born 1964 in Karlsruhe. Trained as a piano builder. Studies in Music and Communication (Technical University, Berlin) as well as Broadcast Communication Arts (San Francisco State University). Radio, audiotape works, sound installations. Publications on sound art and contemporary music. Cooperated for the festivals and exhibitions “sonambiente” (Akademie der Künste, Berlin 1996) and net_condition (ZKM Karlsruhe 1999). 2002 Ph.D. on Net music. Since 1998 lecturer at the University of Halle-Wittenberg at the Institute for Musicology, since 2002 at the Institute for Media and Communication. Since 2007 Junior Professor for “intercultural media science: focus audio culture”. Research: aesthetics and reception of media based art form (electracoustic music, sound art, radio art, netmusic), function and aesthetics of music and sound design in audiovisual media (film, video clip, computer game), history of the audio media in intercultural comparison, systematics of the audiocultural research.